(l to r) Roy Cunanan, Karl Ports and Jeff Goll work on a planter box. Fletcher Hills Kiwanis Club and Orchard Supply Hardware (OSH) co-sponsored a building project to brighten the lives of residents of Country Manor Healthcare Center in La Mesa. Members of the Kiwanis Builders Club at Parkway Middle School and their families visited OSH Saturday, April 14. 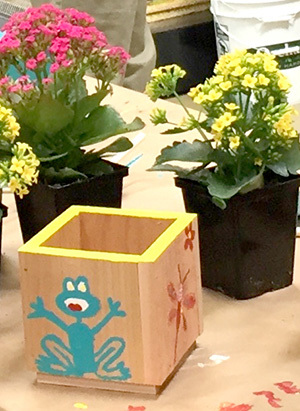 All the building materials needed to build small individual planter boxes and the beautiful blooming Kalanchoe succulent plants that were placed in them were supplied by OSH. 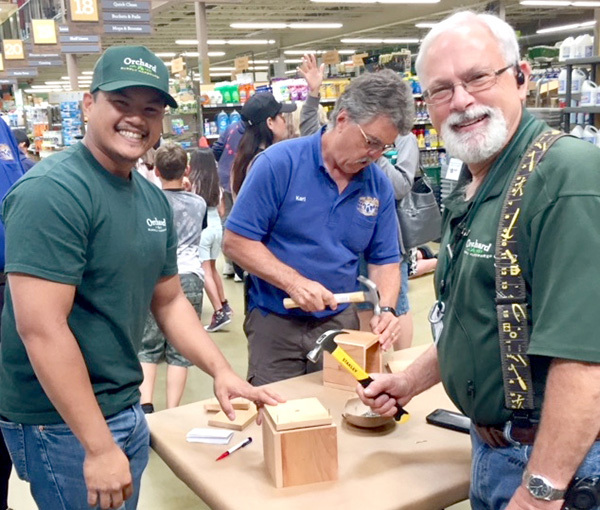 OSH employees Jeff Goll and Rory Cunanan coordinated the event by setting up tables at the back of the store with all the necessary tools, wood and paint to build and decorate the boxes. Goll cut 215 pieces of cedar wood and drilled 559 guide holes for the nails. Cunanan made sure the finished flower boxes got delivered to Country Manor. Fletcher Hills Kiwanis members who participated include Bonnie Kopp, Lisbeth Hether, Chuck Fleming, Dave Liss and Karl Ports. They, along with Parkway Middle School Principal Mary Beason and Builders Club Faculty Advisors Amy St. Cyr and William Littig, all helped or tried to help build and paint the boxes.